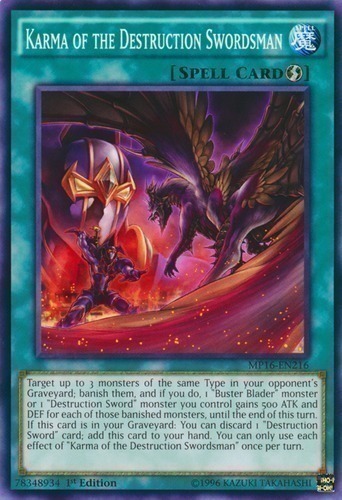 Target up to 3 monsters of the same Type in your opponent's Graveyard; banish them, and if you do, 1 "Buster Blader" monster or 1 "Destruction Sword" monster you control gains 500 ATK and DEF for each of those banished monsters, until the end of this turn. If this card is in your Graveyard: You can discard 1 "Destruction Sword" card; add this card to your hand. You can only use each effect of "Karma of the Destruction Swordsman" once per turn.